For those wishing to create a calming ambience for their room or simply add a decorative feature, a 3D moon lamp makes for a beautiful addition to any space. Many people are unaware of how lighting can transform an entire setting and a moon lamp is the perfect accessory whether it is used as a dim light, a show piece or your child’s night light. 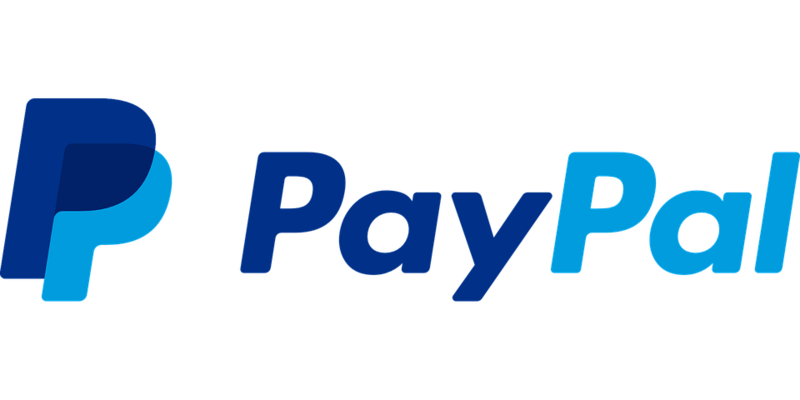 Our online store offers high quality 3D moon and luna lamps, and accessories, at very affordable prices plus free shipping, making it easier than ever to add that special touch to a room. 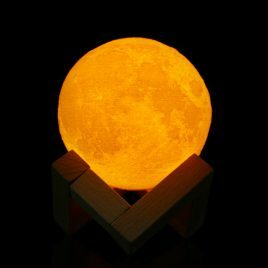 Our moon lamps come in various shapes, sizes and designs so you are sure to find one that suits your home or office space. They also make wonderful gifts for a friend or loved one, bringing a little light into their home. 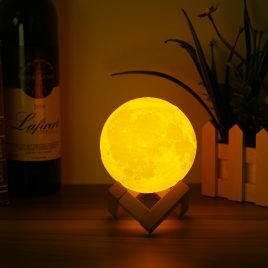 You don’t need to be an astronomer to enjoy the relaxing effects of a moon lamp and it is a unique gift that is sure to be appreciated and admired by everyone. The moon lamps at 3D Illusion Lamps are made using 3D printing technology. The lit up stunning moon sits beautifully atop a wooden scaffold, but can also be taken off to wow children and adults alike. We choose to use eco-friendly materials to produce our moon lamps, which are made from PLDM materials that are non-toxic, odourless and won’t harm the environment. So you can hold the moon in your hands with peace of mind knowing that it is safe for your children and for the planet. We create our moon and luna lamps in many variations, including both mini and larger versions. Our mini moons can be held in the palm of your hand, while the larger ones offer a more immersive experience. A simple switch at the bottom can change the moon between white and yellow light depending on your mood, while the brightness can be easily adjusted with the touch of your hand. All our moon lamps come with a USB power supply, rechargeable battery, touch switch and LED light. There is nothing more awe-inspiring than staring up at the sky on a clear night and basking in the stars and moon light. With a moon or luna lamp, you can have a similar experience from the comfort of your own bedroom or living space. 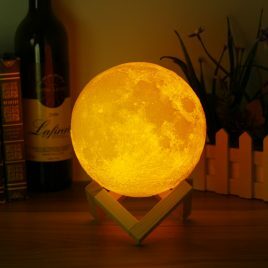 A moon lamp can create a relaxing environment to wind down in after a long day, and can cultivate positive feelings to give you a good night’s sleep and motivate you for the day ahead. It is also a wonderful addition to a child’s bedroom, providing not only a comforting night light, but also sparking curiosity about astronomy and entertainment for your child. The soothing benefits of a moon lamp are in addition to it being a stunning decorative piece. It will add a bit of art and fantasy to your space, giving it that super unique touch. The light display is sure to be a talking point for any guests who come over, recreating the surface and texture of the moon and transforming the atmosphere when the lights are turned off. 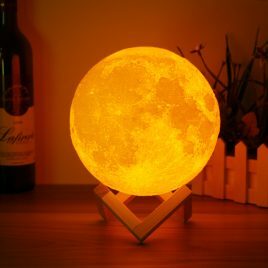 If you are searching for a one-of-a-kind gift, or feel like your room is lacking that special something, a moon lamp may be just what you are looking for. With our extensive range of top quality 3D illusion lamps and accessories to suit spaces of all kinds, you are sure to find something that is perfect for you.